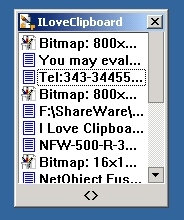 To introduce ILoveClipboard, we are offering a $15.95 SPECIAL LIMITED TIME OFFER for this version! Click here to order now! ILoveClipboard is a useful software utility to help you manage the Windows clipboard. It can save your copied data completely. You can copy once and paste it many times. It supports text and bitmap images. You can paste the content anywhere, anytime. All the data in the clipboard will be saved when the application exits.